Recovering Working Mom: Camp Runamuck . 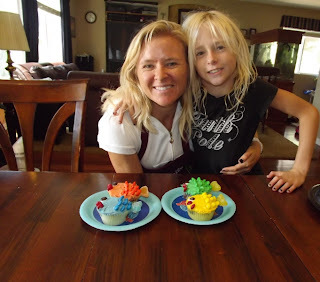 . . Cupcake Wars! . . . And Mice??? Camp Runamuck . . . Cupcake Wars! . . . And Mice??? Yep, I said mice. 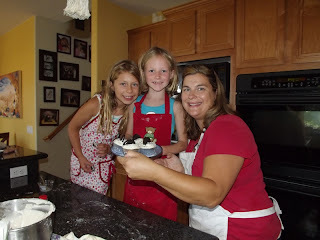 So, one of my friends called “Camp Mommy” something so fitting the other day . . . Camp Runamuck. I loved it and it has stuck. And, quite honestly, it is a perfect description of today’s insanity. For Camp Runamuck family fun today I decided to invite two friends and their kids over for Cupcake Wars. 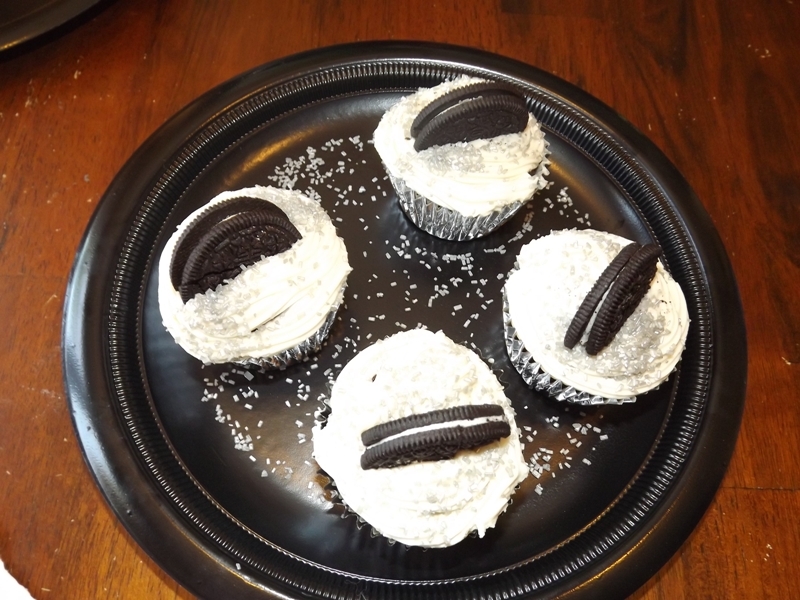 The premise was in 45 minutes to bake and decorate 4 cupcakes that would then be judged by the Boys & Girls Club Staff down the street. 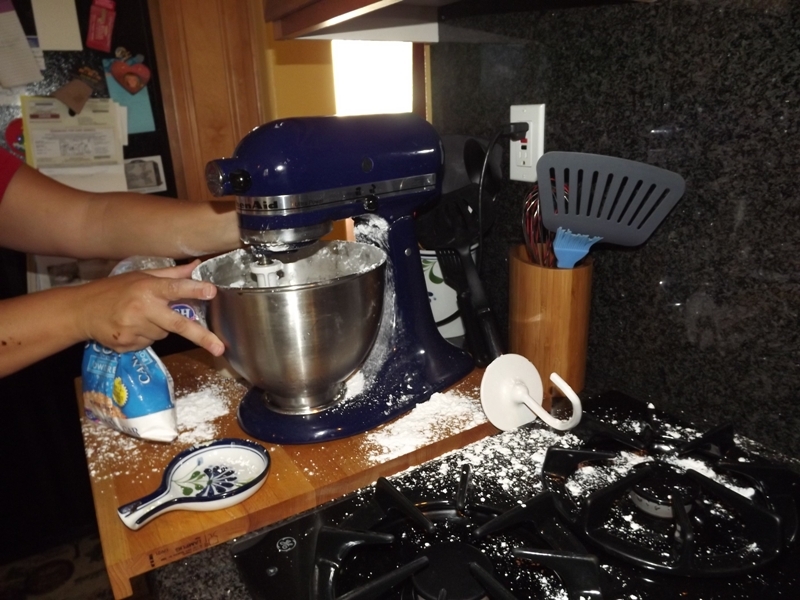 2) When you decide to let BFF Molly’s team of 7 year old children be in charge of the powdered sugar frosting, you really should watch the mixer more closely. We had a literal explosion of powdered sugar that at this moment (11:26pm) is still on the floor of the Camp Runamuck kitchen because mommy’s too tired to clean it up. I was hoping the dog would do it, but apparently he has standards and sugar on the floor just isn’t appealing to him. 3) When setting out the cupcakes to get ready to go to the judging panel, MAKE SURE you put them far enough from the edge of the table so that your Camp Runamuck mascot does not eat one of your “fishy cupcakes”. Damn dog ate two of them in 6 seconds flat. I’m leaving him on my husband’s side of the bed tonight. 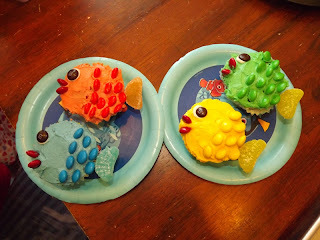 Fishy cupcake recipe came from Disney Family Fun Magazine. And now, for the mouse in the house. Right as we’re getting ready to leave the house today Ego (the middle child) casually mentions that there’s a mouse in Id’s (the youngest) room. I didn’t believe her, but sure enough I went upstairs and there that little booger was. This is Murphy’s law . 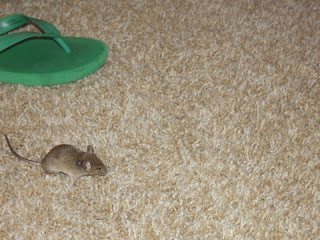 . . last week it was the dog with fleas and this week it’s mice . . . while the husband’s away, the mice will COME OUT AND SCARE THE CRAP OUT OF MOMMY. Really, between the dog pee yesterday and the mouse today, I’m certain God is punishing me for the “I heart Jesus” tattoos in Las Vegas and for leaving the children for three days. 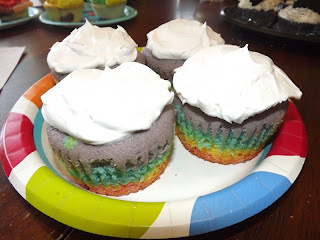 Cupcake Wars with friends. 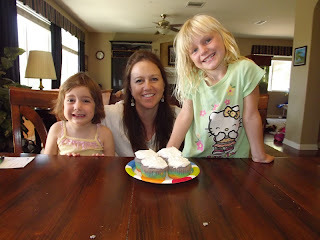 We had so much fun and the cupcakes turned out so fantastic!! I’ve never tried so hard with cupcakes and had them actually turn out right. Valium – No explanation necessary.